For some people, survivorship is the goal of treatment. For Barb Cavelius it is a way of life. Barb taught in Baltimore public schools for 26 years. In retirement she has transformed her love for her students into heartfelt affection for her co-survivors. Because she is grateful for every day she is in remission, Barb expresses her gratitude through meaningful service at JHH and beyond. Barb is a two-time Leukemia (AML) survivor and a bone marrow transplant recipient. In 2010 she began what she refers to as her “fight against cancer”. She knows how frightening a cancer diagnosis can be. Barb experienced firsthand the distress that goes along with intense cancer treatment. She also knows first-hand the blessings of love, support, and care from her family and friends, as well as the caregivers at Johns Hopkins. Consequently Barb sought a creative outlet for her desire to make a difference in the lives of others. She found this opportunity along with her beloved dog, a goldendoodle named Molly, when they joined the Johns Hopkins Animal Assisted Therapy program. This amazing volunteer program allows Barb and Molly to share love and compassion as well as hope, with patients and family members. 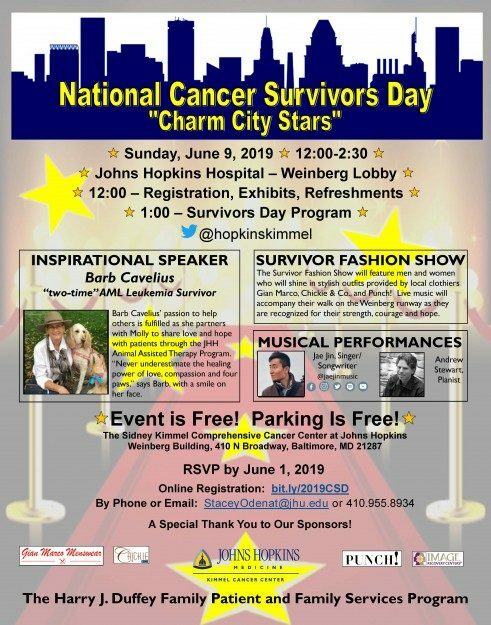 Barb proudly maintains that we should “never underestimate the healing powers of love, compassion, and four paws.” On June 9, 2019, we are delighted that Barb Cavelius will the inspirational speaker for the annual Cancer Survivors Day.